Just south of Wichita, a collection of life-size animatronic dinosaurs offer visitors a chance to trek through a Kansas version of Jurassic Park. The experience combines art, puppetry and theatre to take guests on a scientific expedition among these lifelike creatures. Field Station: Dinosaurs opened earlier this summer as the country’s largest dinosaur-themed park. The $11 million, 14-acre attraction features more than 40 hand-carved and painted animatronic dinosaurs built to scale, informative and interactive live shows, workshops, games, a miniature golf course and North America’s first challenge dome.This is the second park of its kind in the U.S. with the other location outside New York City. The dinosaurs move and make sounds. There are familiar species like Stegosaurus and T. rex as well as lesser-known dinosaurs discovered right here in Kansas. Conference attendees and their families will enjoy this unique journey. It’s hard to miss the Arkansas River that flows through the heart of Wichita. Most conference attendees don’t pack their kayak and they don’t need to! It’s never been easier for visitors to get out and enjoy this stretch of the river, which the U.S. National Park Service has named one of its prestigious National Water Trails. 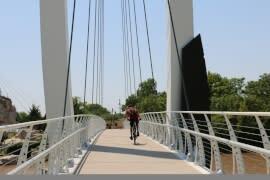 We have three seasonal options that include equipment (and instruction if needed): sunrise and sunset stand-up paddle board and kayak tours operated by the city’s Park & Recreation department; open kayak & SUP rentals on summer Saturdays; and monthly 10-mile floats organized by Arkansas River Coalition. By Spring 2019, there will be a year-round, daily rental option: Boats and Bikes is opening inside a new boathouse on a new 240-foot public dock. They will rent canoes, kayaks and paddleboats as well as wheeled rentals, from bicycles to skateboards. 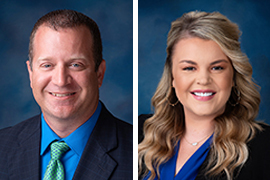 Visit Wichita has hired Brian Hargrove in a newly created role of executive director of sports development and Kylie Kendall as convention services manager. Hargrove will work hand-in-hand with sports sales manager Josh Howell to attract sporting events to Wichita. Hargrove has 20 years of experience in the sports industry, most recently as general manager of the Wichita Sports Forum. Previously he handled events and marketing for the Greater Wichita Area Sports Commission and worked in two Olympic games – Sydney, Australia and Athens, Greece. As convention services manager, Kendall is the main point of contact for corporate event planners and association officials, linking them with vendors, services and attractions and coordinating details to ensure their event is a success. Kendall replaces Susan Cohrs, who recently moved into the role of director of partnership development for Visit Wichita. Get in touch with any of our team members here. The Visit Wichita sales team will be at numerous industry tradeshows in the coming months. We’d love to meet you in person at any of the following events. Aug. 18-21:ASAE Annual Meeting & Expo, Chicago, Ill.
Sept. 5-9:Professional Fraternity Association National Convention, Wichita, Kan.
Sept. 10-13:S.P.O.R.T.S. Relationship Conference, Winston-Salem, N.C.
Sept. 23-25:Small Market Meetings Conference, Ontario, Calif.
Oct. 1-4:TEAMS Conference & Expo, Louisville, Ky.
Oct. 16-18:NBAA Business Aviation Convention & Exhibition, Orlando, Fla.
Nov. 12-14:Connect Faith MarketPlace, Ontario, Calif.